I linked up one of the hardest posts I've ever written - it probably wouldn't have been written were it not for the encouragement of my husband, but I'm so glad he did. ArtBLT celebrates art in all forms: music, dance, film, and more. Come join us and rock on! 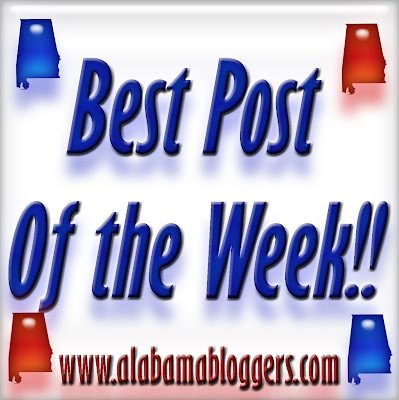 Alabama bloggers unite. I picked the post for my Summer 2011 Mix Tape which includes some love for 1994. I shared my newest social media love- Pinterest. 6. Magic City Post - The Edge theater in Eastwood is showing 18 more free family films this summer. 7. Wade Kwon.com - My address to the Class of 2011. 8. Wade on Birmingham - A great new video series asks the question, Why Birmingham? 9. Birmingham Blogging Academy - 31 tips on better blogging. All my posts this week have been jewelry-making (that's my business after all) related. I had a hard time picking out one. So, I just liked to the one with the prettiest pictures. . .my Bead Table Wednesday post. Enjoy! Hey. I'm sharing the Winn Dixie deals that are 40+% off during this week's ad. No coupons needed. I linked my "Friday Farm Tidbits" post because it gives readers an idea of how the recent weather impacts a dairy farm.